When you were home-shopping, you probably considered more than just the building itself in making your decision. Location is legendary, but other factors are also important. The land your house is on is obviously something that played into your choice. And adding a patio or improving an existing one is a fantastic way to increase your enjoyment of those outdoor areas of our property. 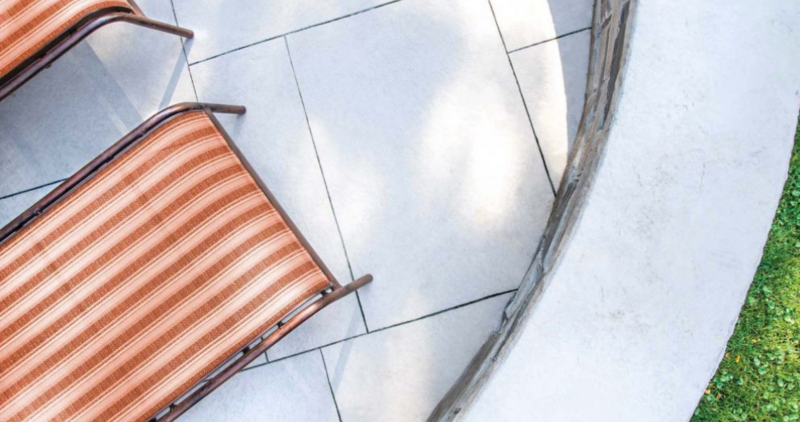 Let’s look at some of the factors to consider when designing your home’s patio! Before getting too deeply into our article, let’s define what exactly we’re talked about. A patio is an open area at ground level that can be made of any of a variety of materials such as concrete, pea gravel, pavers, or wood. It may be attached to your house, or stand on its own. The word patio comes from the Spanish word that means a courtyard. Unlike a courtyard, however, a patio doesn’t have to be surrounded by walls. It’s generally an open space. We recommend a stamped concrete patio because the material is durable, easy to maintain, and can be installed in a wide variety of designs to imitate basically any of the other materials that could be used. It’s not just our specialty; it’s a fantastic product that you can have at a reasonable price. It will live up to your expectations! When you’re considering a patio, you have to look at a number of factors including how you want to use it, how big it should be, where it should be relative to your house, the style of the surface, and any features you want included in its design. The idea of a patio is great, but the first thing you need to think about is how you intend to use it. It can be versatile – you’re not limited to picking one use and eliminating all others. But having an idea of its general use or uses is a key to deciding almost every other aspect. For instance, do you like to entertain? If you like to have larger parties, be sure to have a patio that’s a suitable size. At the same time, you might want to avoid features like a fire pit or steps that guests might trip over when there’s a large crowd. On the other hand, is the area mainly going to be for just you or the family? A smaller surface may work fine if you just want a couple chairs or a picnic table. If you expect to use the area during the day, be sure it has suitable shade – whether that’s provided by your house, a tree or some other feature you can add. And if you plan on evening usage, be sure the patio will have easy access to electricity. Patios are great for outdoor living areas or kitchens, for play areas or gatherings. Knowing how you intend to use it will help you design it appropriately right from the start. Obviously, the size of your patio is going to depend on a few factors. The intended use, as we just talked about, is an important one. Of course, another factor is the total size of your yard and what you want to use the rest of it for. Some people will like a large garden, while others prefer a simple lawn. You’ll have to balance the amount of green space you want to conserve with the patio area. The type of patio you choose and its layout of course also depend on other natural features of your yard. Is it on a slope? Are there issues with drainage? Are there trees that you want to preserve? All of those elements affect how big your patio should be. If your yard is uneven, another option to consider having multiple layers of patio with a step or two between them. This also lets you create the idea of having separate “rooms” with different functions. A patio doesn’t necessarily have to be attached to your house. Depending on its purpose, you might want it to be separated. Again, this depends on how you want to use it. 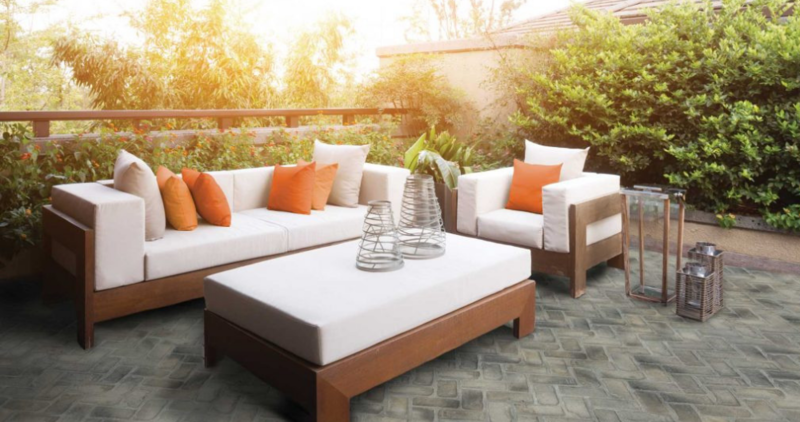 If you want to just step out the door and begin enjoying your patio area, a surface adjacent to your house is ideal. However, you might want something a few meters away from the nearest wall if your yard allows the space. This can help create the feeling of really moving into a new space and help increase the relaxation you feel. If your patio is going to contain an outdoor kitchen, it can also affect the placement of your patio. It can largely depend on the design of your house, though. Having an outdoor kitchen that’s easily accessible from your indoor kitchen is great. On the other hand, you may not want the smells or sounds drifting into the bedroom or living room so you wouldn’t want it situated near those windows. A patio can also be great around a pool or when it features a fire pit. Safety considerations and convenience have to be taken into consideration, of course. But again, those might not be the ideal elements to have just outside the door of the house. If you choose to have your patio set off from your house, don’t forget that you can easily add a simple path from the door, too. The appearance and style of your patio ultimately depend on your personal taste. The style you choose will affect the material used in your patio. One of the great advantages of a stamped concrete patio is that you can do almost anything with it and create any style you’d like. The architecture of your home and the landscaping of your property are the most common forces behind choosing a style of patio surface. Most people want something that blends with everything around it. For instance, a brick home is complemented well with a brick patio, or at least one made to look like brick. A colonial house might work best with a cobblestone surface. Other natural-stone looks or even wood can work well and tie in easily to the theme you want. Many other elements can be incorporated into your patio as well. While they can be added afterwards, it’s best to plan ahead and complete them as part of the installation. Having power to your patio isn’t quite essential, but it’s sure helpful. You can have your home’s electric lines run to the patio even if it’s set off from the house. That can provide light as well as a place to plug in your phone charger, a TV to enjoy the game outdoors, or maybe a blender for your bar/kitchen. You might even opt to run a gas line to the patio to use a gas stove or gas-powered patio lights. Just because you’re outdoors doesn’t mean you have to rough it! We’ve already mentioned that patios can include fire pits as well as being the surface around a pool. Flower beds are another great idea. You can continue the style of the patio and have them built into the surface instead of trying to find matching flower pots later on. Another feature to consider is a pergola or other covering for the patio. This can serve both a functional and aesthetic purpose. It can shield you from the elements and allow you even greater use of the patio. It can also be the type of feature that adds a bit of character. You might even add some climbing plants to it! There are endless possibilities for the features you can add – a fountain, a koi pond and much more. The only limit is your imagination! A patio is an incredibly functional part of your property that allows you to express your character and enjoy the outdoors – alone, with your family or in a large group. A stamped concrete patio offers a great deal of flexibility and can be designed to fit your needs no matter the size, style or use you plan. Don’t be stuck in the house – enjoy your whole property by creating the outdoor escape you can achieve with a magnificent patio!